Take Highway 199 to the small community of Selma and turn on to Deer Creek Road located at an intersection marked by a flashing yellow light and a large grocery store. Deer Creek Road has several abrupt and sharp turns that can be dangerous if you are driving too fast. Follow Deer Creek Road for about eight and a half miles and look for White Creek Road on the right. Follow White Creek Road for about a half mile watching for a well graded gravel road on the left. Follow this road about three miles to the trailhead that is located at an intersection with another road on the left. 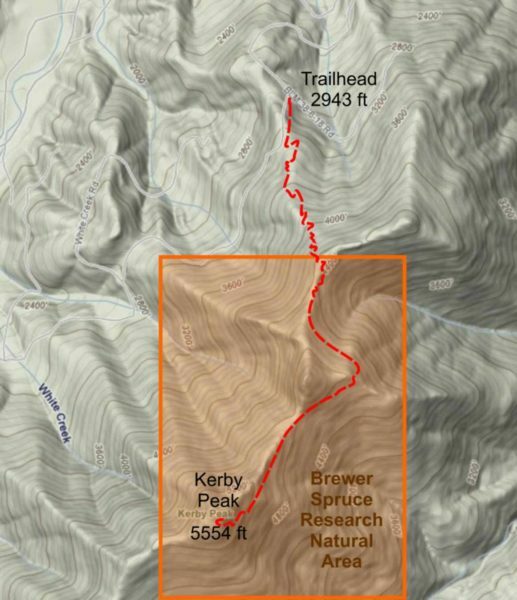 Kerby Peak Trail is one of the steepest trails along the Highway 199 corridor. It starts at an elevation of 2,943 feet and climbs steadily for about a mile and a half through a beautiful forest of Douglas-fir to an elevation of about 4,400 feet where it levels out at a saddle near Kerby Peak. The trail climbs at a more gentle rate with vistas of the surrounding mountains seen several places along the way. Brewers spruce are encountered just before the final ascent to Kerby Peak, which climbs through small stands of manzanita to the peak at 5,554 ft elevation.